What are the physiological functions of biological membranes? Eukaryotic cells and their organelles are enveloped by viscoelastic layers made of lipids and proteins. These layers are generally referred to as cell membranes and when they surround the entire cell, they are specifically known as the plasma membrane. The plasma membrane functions as a physical and electrical barrier that restricts the entry of foreign material into the cell and prevents cellular contents from leaking out. As the primary interface between the cell and its microenvironment, the plasma membrane mediates communication with neighboring cells as well as the extracellular matrix, via a number of cell adhesion proteins residing on this cellular structure. It serves as a hub for highly dynamic and diverse cellular biochemistry, as a number of external signals mediating fundamental cellular functions are relayed by diverse classes of membrane-bound proteins and lipids . It also regulates the mechanical properties of the cell, as it determines cell shape by conforming to the arrangement of cytoskeletal structures inside the cell and aids in cell motility by undergoing restructuring concomitant to the cytoskeletal rearrangements . In addition, cell membranes also play a role in compartmentalizing the cell and defining its organelle spaces, so that correct molecular components are recruited to distinct organelles for carrying out organelle-specific functions. Biological membranes are known to exist in different structures and phases, such as bilayers, micelles, hexagonal, and cubic phases . However, the most common structure of membranes is described in the classic fluid mosaic model that was put forth by SJ Singer and GL Nicolson in 1972 . According to this model, membranes are depicted as two-dimensional fluids made up of lipid bilayers that are interspersed with proteins in a mosaic-like fashion. The hydrophilic phosphate head groups of the lipid molecules are in contact with the aqueous environment at the outer surface of the bilayer, whereas the two hydrophobic lipid chains are sequestered to the inner side of the bilayer away from any contact with the fluidic environment. The fluid mosaic model incorporates the dynamic nature of bilayer membrane organization that occurs due to the constant rotational and lateral motion of the integral lipid and protein molecules. The molecular composition of cell membranes is responsible for determining its physiochemical properties. For instance, a number of membrane properties including its phase behavior, viscosity (ability to flow like a liquid), rigidity, and thickness are determined by the types of lipids and their densities found in the membrane . Similarly, the accumulation of several curvature-sensing lipids and proteins tend to induce curvature in localized regions of the membrane that, at a larger scale, determines its shape . Dynamic lipid-protein interactions on the cell membrane influences the distribution of these molecular components in the bilayer and results in the formation of distinct membrane domains, such as lipid rafts. Such membrane domains serve as precursor sites for the formation of vesicles, invaginations, and protrusions that are essential for the transport of cellular cargo, as well as for internalization of pathogens. Furthermore, the lipids and proteins on the cell membrane diffuse freely within the bilayer unless they are tethered to cytoskeletal structures, extracellular matrix or to other membrane proteins. The continuous diffusion of molecular components within the bilayer, coupled to the loose packing of hydrocarbon tails of membrane lipids, is responsible for the viscous nature (not solid-like) nature of cell membranes . Similarly, the rigid ring structures of cholesterol molecules inserted in between the phospholipids produces temperature-dependent effects on membrane structures. A diverse population of lipids, which mainly vary in size and chemical properties of their head groups and fatty acid chains, and the type of linkages formed between these two structural domains, constitute the cell membrane. These include a number of phosphatidylcholines, phosphatidylethanolamines, phosphatidylserines, sphingolipids, phosphoinositides, glycolipids, and cholesterol . 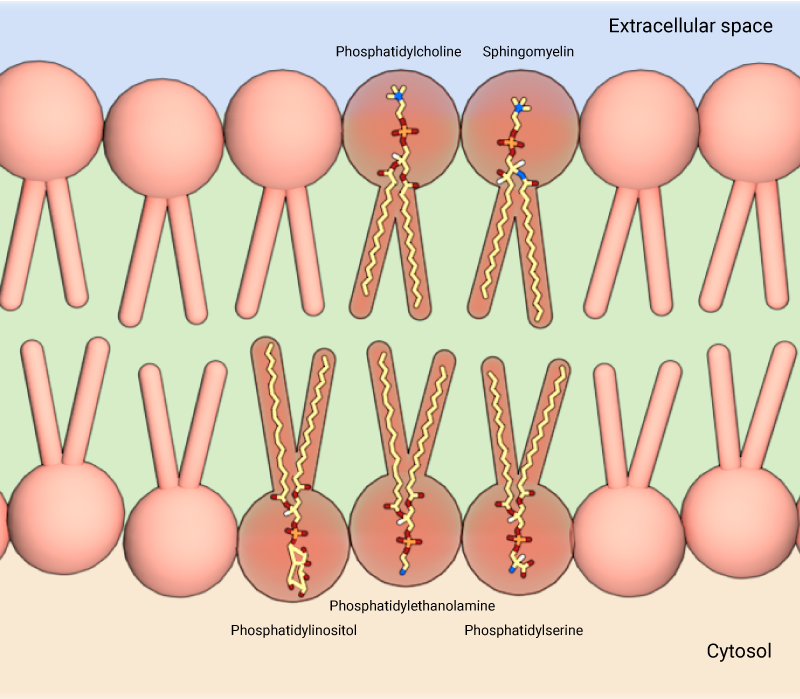 While phosphatidylcholine and sphingolipids predominate the outer leaflet of the lipid bilayer, the inner leaflet is primarily constituted by phosphatidylethanolamine, phosphatidylinositol and phosphatidylserine. This chemical diversity is further magnified by the action of several membrane-bound enzymes that possess different lipid metabolizing functions. However, highly regulated pathways of lipid synthesis and transport across the cell influences the molecular composition of lipids in different cell organelles as well as within the different leaflets of the same bilayer that determines its physicochemical properties, and thus its biological functions . Membrane lipids consist of phosphatidylcholine and sphingolipids on the outer leaflet, and phosphatidylethanolamine, phosphatidylinositol and phosphatidylserine on the inner leaflet. 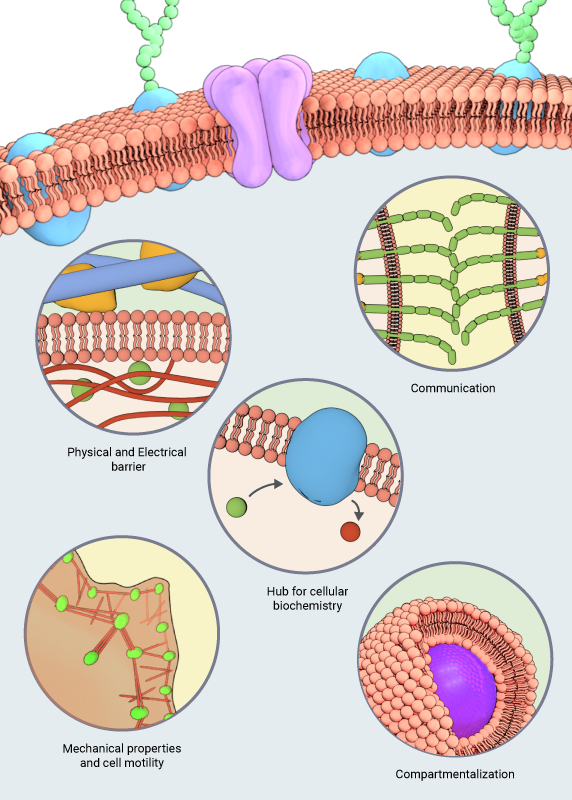 While lipids contribute primarily to the structural characteristics of cell membranes, an equally diverse set of proteins that localize to the membranes, including receptors, transporters, cell adhesion molecules, enzymes, and energy transducing proteins are involved in diverse biological functions associated with membranes. Proteins are recruited to membranes either through their interactions with membrane lipids or with other membrane proteins, and these interactions are closely regulated by post translational modifications of either of the interacting partners. At the membrane, proteins are either attached to a single leaflet of the lipid bilayer or they extend across the bilayer, in which case they are known as transmembrane proteins. While some transmembrane proteins cross the membrane a single time (single-pass transmembrane proteins), others pass in and out of the membrane several times (multi-pass transmembrane proteins). In recent years, the structures of some membrane proteins have been identified through the use of techniques such as X-ray crystallography and NMR spectroscopy, but the structural characterization of the bulk of membrane proteins has been difficult due to the close association of these proteins with the lipid bilayer, where they are affected by membrane physicochemical properties ,, The Cell: A Molecular Approach. 2nd edition]. Any communication or interactions between the intracellular and extracellular spaces occurs through the plasma membrane, which forms the boundary between these two regions. One of its main roles at the interface is to serve as a permeability barrier that facilitates selective transport of ions and molecules in and out of the cell. 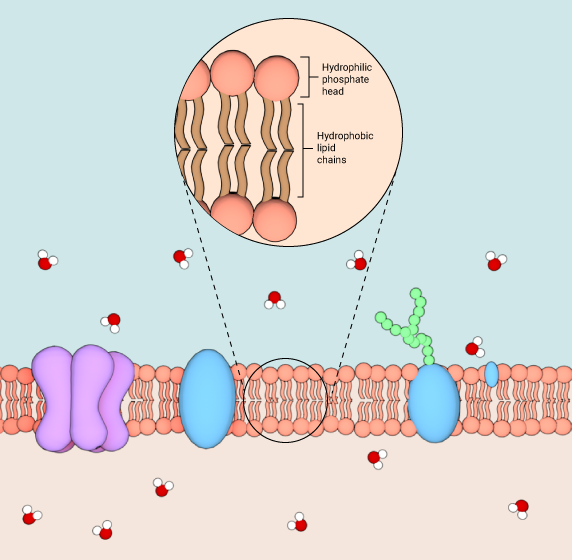 The hydrophobic core of the lipid bilayer serves as an impermeable layer for the water-soluble molecules, including ions and most biological molecules, to pass through. However, specific ions and molecules are transported through channels and pores formed by membrane proteins. Such controlled transport systems across the membrane have a vital role in regulating the intracellular composition and the volume of the cell . The plasma membrane is also directly responsible for initiating a myriad of biochemical signaling pathways in cells. It serves as the platform for receiving extracellular signals (chemical, electrical, or mechanical), and relaying the signals internally through the activation of membrane-associated proteins as well as intracellular secondary messengers. A range of cell surface proteins, including receptors, cell adhesion and signaling molecules are responsible for initiating the signaling functions of the plasma membrane. For instance, in response to external signals that induce cell movement, membrane receptors and membrane-bound GEFs activate Rho GTPases such as Rho, Rac, and Cdc42 that mediate signaling pathways leading to activation of the motility machinery, in particular, the actin polymerization machinery , . Membranes serve as an interface between the cell and its environment. Cell adhesion molecules embedded in the membrane, such as integrin or E-cadherein, allow interactions with the ECM (top panel) and neighboring cells (bottom panel), respectively. One class of membrane proteins known as cell adhesion molecules play an essential role in coupling the cell to its extracellular environment, which includes neighboring cells as well as the extracellular matrix. 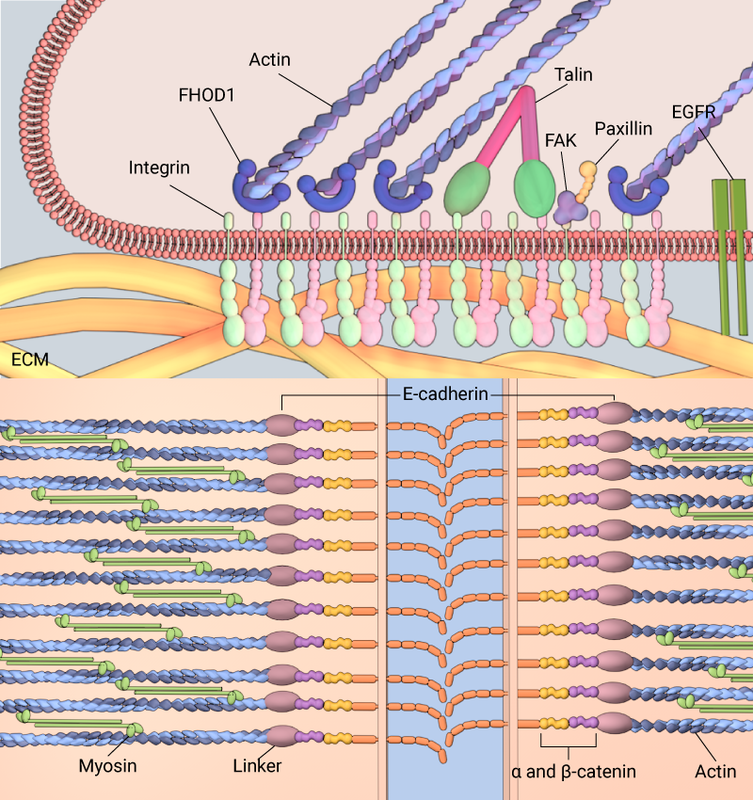 Two most-studied cell adhesion molecules include the integrin and cadherin family of proteins; while integrins localize to the leading edge of motile cells and mediate adhesions between the cellular cytoskeleton and extracellular matrix that generates traction forces for cell motility, cadherins facilitate cellular organization into tissues by interacting with cadherin family proteins on neighboring cell membranes and mechanically coupling the cytoskeletal structures of cells forming the tissue ,. Another major biological role of cell membranes is in mediating vesicular transport, either during the secretory pathway when proteins are transported from the endoplasmic reticulum to target locations such as lysosomes, endosomes, the plasma membrane and into the extracellular space or during the endocytic pathway, during which proteins and other macromolecules such as nutrients, fluids are internalized into the cell from the extracellular space. Specialized membranous containers called vesicles are used in almost all stages of these transport processes. 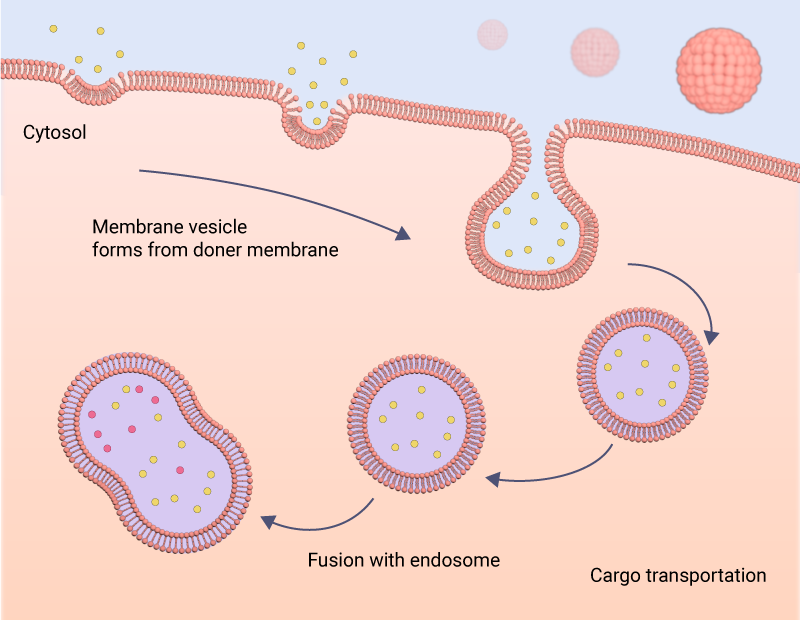 Membrane vesicles form on donor organelle membranes, bud off enclosing the cargo, and then fuse with the receiving organelle membrane delivering the cargo inside the organelle. Several of the Rab and Arf family GTPases, cytosolic coat proteins such as clathrins and caveolins, membrane curvature-inducing proteins like the BARs and N-BARs, membrane scission proteins like the dynamins, and membrane fusion proteins like the SNAREs are closely involved in the membrane trafficking process , , , . Membranes facilitate the trafficking of cellular cargo throughout the cell. 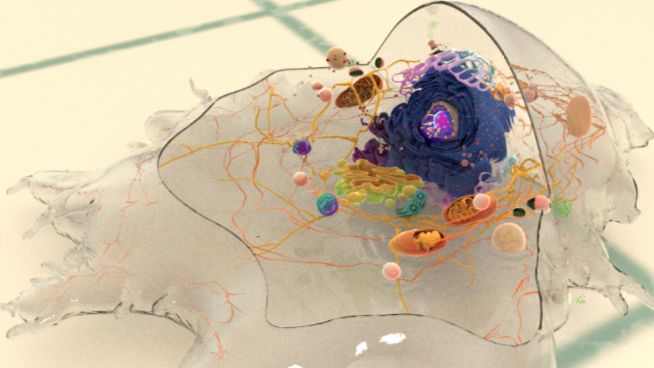 This may occur as endocytosis, as depicted here, where material is taken into the cell, or as exocytosis, where material is expelled from the cell. In addition to being regulated by defined biochemical signaling pathways, the efficiency of membrane trafficking systems in cells are influenced by physical factors, such as increased membrane tension. During the internalization of pathogens within phagocytic vesicles, an increase in membrane tension serves as a feedback for triggering exocytic pathways that will aid in the recycling of membrane proteins in order to increase the membrane area for the formation of more phagocytic vesicles . Furthermore, forces generated by molecular motors along the cytoskeletal tracks are used to physically shuttle membrane vesicles across the cell. Most vesicles traffic along microtubules using kinesin or dynein motors, although they can also use myosin II and myosin V motors to move along the actin network ,.